← Japanese Baked Kit Kats! I’ve been loving Classic children’s book illustrations lately. After my watercolor of Kiki’s Delivery Service last week I decided to look at the work of E. H. Shephard. I really enjoy his work, and I’ve been enjoying learning about his life. It’s the tail-end of 花見 or hanami season here, so I like to think that Christopher Robin took his friends out for a little flower viewing picnic 🙂 This piece is of course based on Shephard’s classic Pooh from the books with A.A. Milne. What do you think? 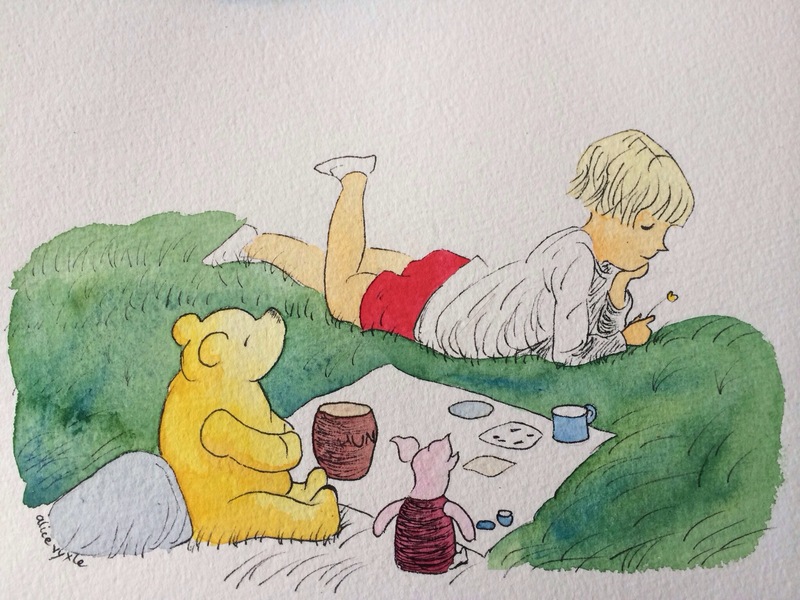 This entry was posted in Art and tagged Art, christopher robin, eatercolor, illustration, piglet, pooh, watercolor, winnie the pooh. Bookmark the permalink. Classic Pooh is the ONLY Pooh. Disney’s is a heresy. Shepherd was the master of line. You’re doin’ good!